A first look for many of us! 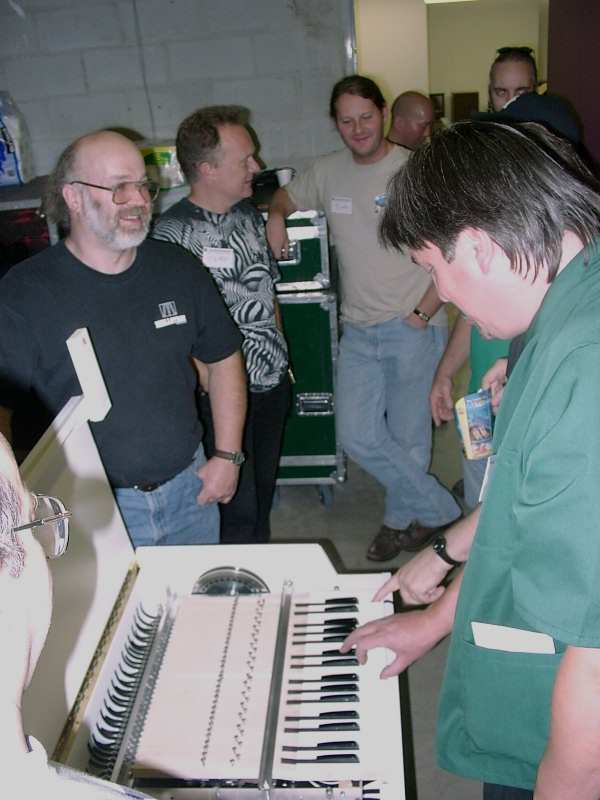 Dave Kean has been producing the Mellotron Mark VI for some time now, but few of the Mellotronists in attendance had seen one. This was our first look. Outside it's a fine looking unit. Clay had added some edging for protection, but the finish feels thick and durable. It's not a smooth finish, but it suits the machine and looks great. It will certainly outlive the finish on chippy ol' #805! Inside this is easily the cleanest 'tron I've ever seen! The metal is shiny, there are no marks on the paint anywhere...Well, it is brand new, after all! 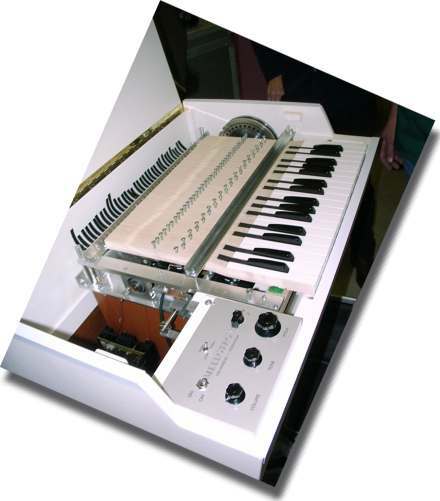 Note the hinged cover, as with the EMI 'trons. 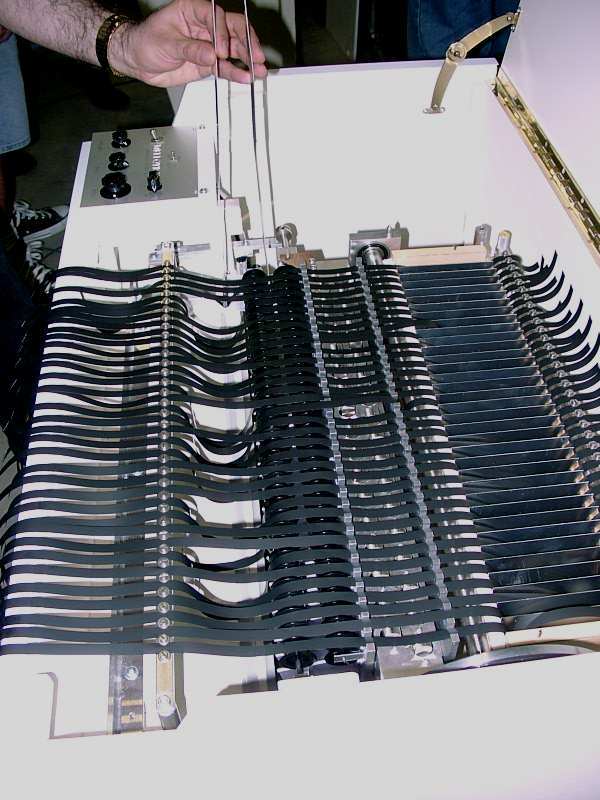 Changes from the M400 include deeper combs (tape guides) and rollers on the front where the tapes fall into the frame. 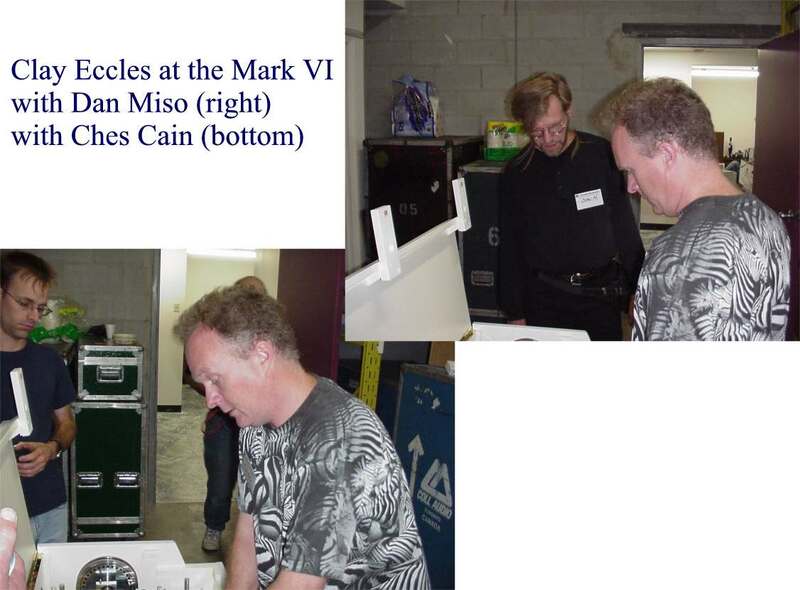 Dave Kean also included the keyboard modification started by Pierre where the pressure pad arm adjustment screws are moved closer to the pad arms themselves. 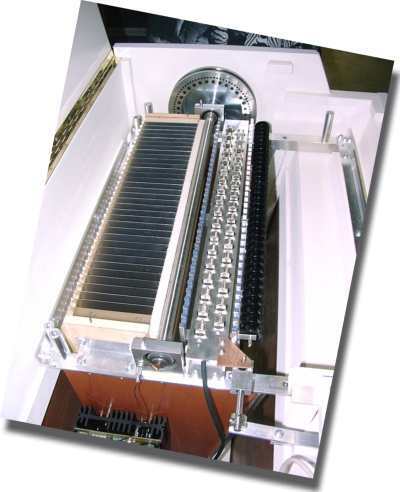 The extra wheels in the front make lacing a tape frame a little bit more interesting, as there's not much room behind the top roller of the frame to send the tape loop down into the column. But with a little practice and the right tool, it's not a big deal and really isn't any more difficult to lace than any other frame-based 'tron. The Mark VI control panel with its neat MELLOTRON light! 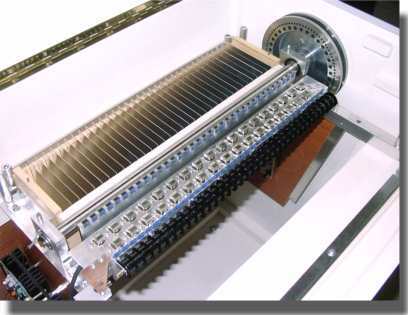 Note the LOW-HIGH speed option, available with the SMS-5 motor controller that's in the machine. How did it sound? 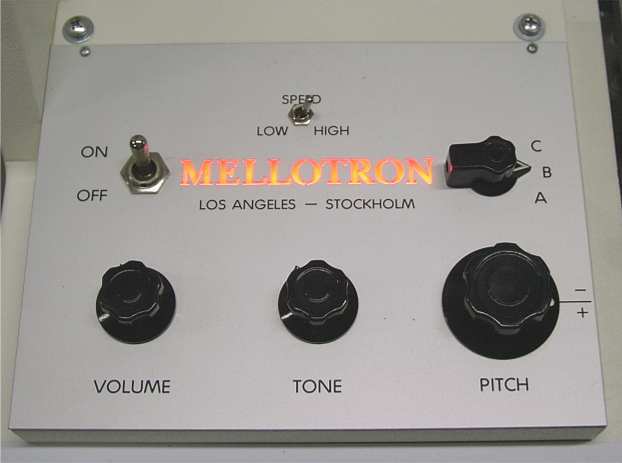 Like a Mellotron. :-) It would have been nice to have listened to it through 'phones instead of through the PA along with everything else, but the machine ran well and played the tapes cut by Streetly in the UK without a problem. The low-high speed switch is a real trip! Boy do those tapes sound different at half speed! 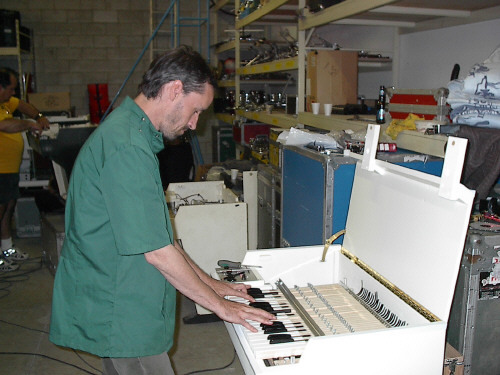 No wonder why Duncan Goddard (of RMI - Radio Massacre International) modified his motor controller to do it and Ken Merbler rigged a similar setup in his 'tron from Nashville. It just goes to show you that these machines are touchy and have minds of their own, whether built in the UK in 1963 or the US or Sweden in 2001. 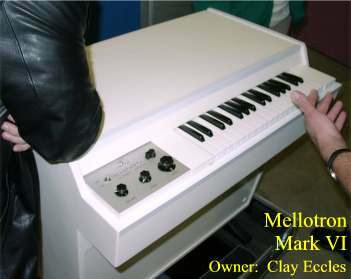 But that's a Mellotron by definition.